Combine the artichokes, half-and-half, garlic, red pepper flakes and 1/4 teaspoon salt in a large skillet and bring to a simmer over medium heat. Cover and cook until the artichokes are tender, about 5 minutes. Add the peas and continue to cook, covered, until tender, about 5 more minutes. Remove from the heat and stir in the lemon zest and juice. Discard the garlic clove. Meanwhile, bring a large pot of salted water to a boil. Add the agnolotti and cook as the label directs. 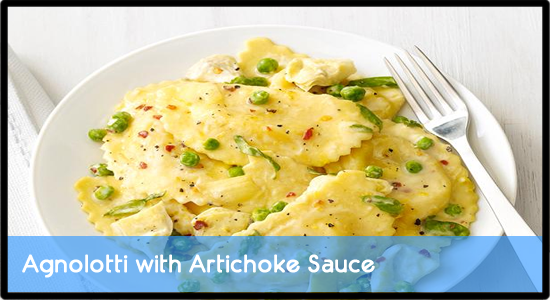 Reserve 1/2 cup cooking water, then drain the pasta and transfer to the skillet with the sauce. Add the parmesan to the skillet and gently stir until the pasta is coated. Thin the sauce with some of the reserved cooking water. Stir in the basil.